This Best Mom Ever t-shirt is just what you need to surprise your mom on that special occasion. 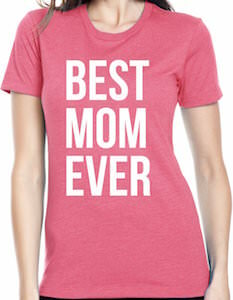 This t-shirt is a light pink with on it in big white letters the words “BEST MOM EVER” and I am sure you mother is going to love wearing it. Mothers day, birthday or any other special occasion this t-shirt will make for the perfect present for your perfect mother. You can order this t-shirt in junior mom’s sizes Small – 2XL and it will be one of those shirts you wished you have bought sooner as you mom is going to love it.